Rhizomatous Iris (Iris rhizomateux): growing, planting, caring. 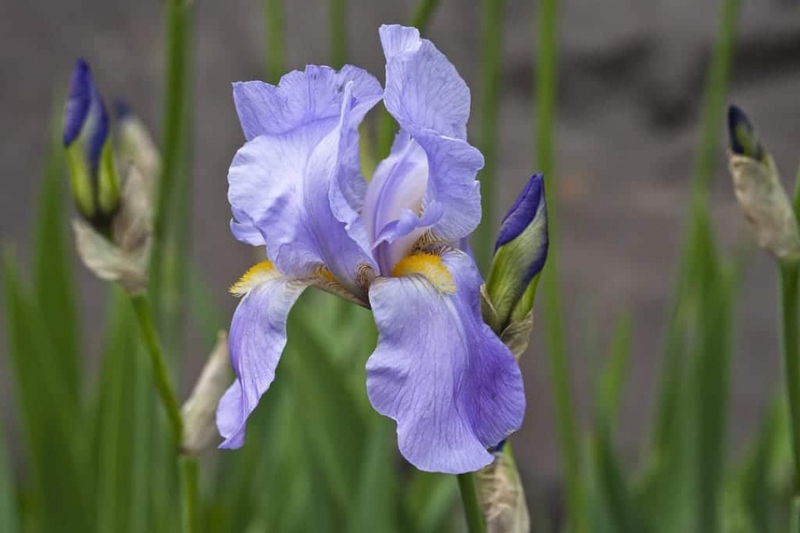 A perennial plant with a spectacular spring blooming, rhizomatous irises come in a variety of species and kinds, bringing you a dynamic mixture of colors and sizes. Rhizomatous irises are spring-blooming perennials with rhizomes that spread a little each year, with no limit. Therefore, you'll have to keep an eye on them to limit their development. To "simplify" their ranking, rhizomatous irises are sorted according to the shape of their flowers, bearded, beardless, or crested. Bearded irises have white or colored fur on their sepals. Beardless irises have solid colored sepals, where crested irises develop "crests" on each petal. Easy! Beyond rhizomatous irises, there are also bulb irises that we won't talk about here. Bearded irises prefer well-drained, rich soil that's neutral or slightly chalky, in direct sunlight. Beardless irises enjoy the sun or partial shade in silty soil that's well-drained, and neutral to slightly acidic. Crested irises grow in the sun or partial shade in rich soil. Bearded irises have white or colored hairs on the sepals. Non-bearded irises have solid sepals and anthers resembling small petals. The ornate irises with ridges develop ridges on each petals. Easy ! The best time to plant is between June and October, so your iris will have time to settle itself before winter. In terms of conditions, we need to look at things separately — we'll make it simple: Bearded irises prefer well-drained, rich soil that's neutral or slightly chalky, in direct sunlight. Beardless irises enjoy the sun or partial shade in silty soil that's well-drained, and neutral to slightly acidic. Crested irises grow in the sun or partial shade in rich soil. Prepare the soil with some light digging (to decompact without necessarily turning it over with a pitchfork or broadfork), hoeing, and raking. Add some soil fertilizer if the earth isn't very rich. Plant the rhizome in a small mound of soil away from humidity — it must be practically showing. Pack lightly, water copiously! You can plant irises in small groups of the same variety to make pretty little colored zones. Water for a while after planting, especially in the summer, until the end of flowering. Iris' must not be watered after flowering, as it is their dormant period! Watch your rhizomatous irises and solve any neighbourhood disputes, as they grow together slowly but surely. Multiply your rhizomatous irises by division between July and September. Do this every three or four years, which can only help the plant. Divide the plant with the help of a spade, according to the way it's growing, it's size, and your desires. This will help clear it out, in addition to multiplying it. Drive a pitchfork 20 centimeters into the plant mass, dig in then pick it up — lift up the root ball. If the soil is heavy, break it up from all around the root ball. Remove the withered flowers, as well as the dried and shattered branches. Split the plant material in two with the help of a well-sharpened and clean spade, perhaps sterilize — if not there's a risk of finding yourself with fungus on the rhizomes... Prepare a hole in loose soil to welcome the "new subject" Additional fertilizer isn't necessary, although a little bit of brown gold won't do any harm Pack down the earth around the base. Water thoroughly during planting and think about watering if it doesn't rain much for the first little while. Regrowth is generally easy. Mulching the perennial plants will save you from watering and weeding and will even fertilize the soil a bit as it decomposes. When choosing, know that dry wood chips are the most inert, but they will last for a longer time. Fresh wood chips and leaves enrich the soil but must be changed often. Grass cuttings are to be used mixed with something else in a layer that is at most 1 cm thick. Mulch with at least 3 cm of thickness to ensure it works and isn't simply a cosmetic effect. Slugs and snails lovers of every part of the plant. Attract them somewhere else with an offering of flour, vegetable scraps, or decomposting remains. Bearded irises fear bacterial rot and marks on their foliage, while non bearded types often suffer from grey rot (botrytis). Thrips also devor the leaves.